All aboard for a day of history, funny stories, and the best sightseeing in Savannah. 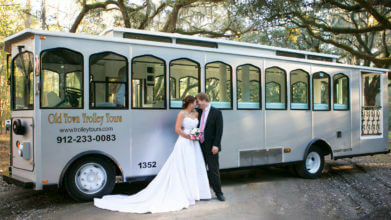 The Old Town Trolley Tour will transport you and your family to all the most popular sights in the city – you’ll be able to get off and on at 15 stops of interest including Forsyth Park, River Street, City Market, Chippewa Square and the world famous, haunted Sorrel-Weed House. Take your time and enjoy all the sights; there’s always another trolley coming along soon. At stop 3, jump off and take the kids for lunch at Mrs. Wilkes Boarding House; you all will love the authentic country cooking served up family style where folks dine together at long tables. Hold your ears & keep your eyes wide open! Load up the convoy and head over to historic Fort Jackson. Old Fort Jackson was named after James Jackson, one-time governor of Georgia and promises an afternoon of adventure for the whole family. Located along the Savannah River, this massive structure was built between 1808 and 1812 and is the oldest brick fort still standing in Georgia. The kids get a real kick out of the cannon-firings and touring this National Historic Landmark. Amazing views of the riverfront skyline are a beautiful bonus. Angela Beasley’s Puppet People is a totally unique, zany show featuring lively puppets of Savannah’s most colorful and infamous characters from the past and present. Children and adults laugh, learn and have an unforgettable time listening to and watching special shows featuring Paula Deen, General James Oglethorpe, Girl Scout Founder Juliette Gordon Low and more. Nothing but fun (and some great history) is brought to life on colorful stages as these characters engage in wild and witty antics before your eyes. Angela’s puppets have been featured on “The Today Show”, “The Early Show”, Comedy Central, and “Georgia Traveler”. Groups, tours and backstage passes where you can “meet” the puppets are also available. Wave to the waving girl! Climb onboard the Georgia Queen Riverboat for an afternoon or evening of sightseeing from the scenic Savannah River. The boat is a replica of a 19th century riverboat with several decks and perfect views for everyone. The decks are spacious so the kids can walk around and see everything – including the famous Waving Girl statue. Tours are about an hour and are a relaxing way to enjoy the river views, learning about the city’s history and the balmy breezes. Other tours offer dinner cruises and snacks, soft drinks and bar drinks. If you take the Old Town Trolley Tour, you can get off at River Street and take the cruise from there. So much fun awaits you in Savannah! Savannah is one of the cities that you can’t just visit once. So much natural beauty and history, warm folks who can’t wait to share their hometown with you and an array of interesting things to do.